A Trouter is a red fish that jumps straight up out of water near waterfalls in Super Mario Bros. 2. Their name is a pun on trout, a type of fish. 1.3 The Super Mario Bros. Super Show! Trouters are used many times throughout the game as platforms in which to jump across a large body of water. Stopping time with the Stop Watch makes it much easier to cross them. Although not deadly from below, they are dangerous if touched from the sides. Not only this, but if Mario, Luigi, Toad, or Princess Toadstool ride the Trouter back to the watery depths, they lose a life. Trouters made return in BS Super Mario USA, when they have the same role in the predecessor. Mario the marine biologist has just discovered some new life forms living at the bottom of the sea: Cheep-Cheeps, Jelectros, Bloobers, and Trouters, to name a few. A Trouter from The Super Mario Bros. Super Show! 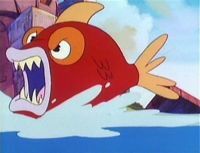 On The Super Mario Bros. Super Show!, Trouters make appearances in numerous episodes, where they are portrayed as being far more vicious than they are in Super Mario Bros. 2. Rather than merely hopping in and out of water, Trouters are shown to be fairly carnivorous with sharp teeth, and try to eat anyone who fall into their water. In this, they behave more like Cheep Cheeps (especially the flying variant), and are likely a combination of the enemies. A running gag throughout the show was that Trouters are usually swimming in whatever body of water that Mario and his friends either have to cross or fall into, often appearing as an unwanted surprise and scaring the group. Sometimes, to show their appetite, Trouters are depicted by wearing bibs, and holding knives and forks. Trouters are not shown to be minions of King Koopa, as they attempt to eat him if given the opportunity. However, it is not uncommon for King Koopa to use Trouters to his advantage, as he sometimes has them guard the waters surrounding his bases in certain episodes. In Nintendo Comics System, Trouters appears in the stories "The Fish That Should've Gotten Away" and "Beauty and the Beach." In the comics, the Trouters featured resemble and act like their cartoon counterparts, but are also depicted as capable of speaking. In the Nintendo 3DS title, Ultimate NES Remix, Trouters are merely represented as enemies in challenges based on Super Mario Bros. 2. They can be stepped on and crossed, acting just like platforms, in order to pass long cascade chasms. Totosu Probably from "toss" and "trout". This page was last edited on February 9, 2019, at 11:30.